George Foreman and the time he fought five men in one night – imagine a top heavyweight doing that today! “Muhammad ‘whatever he wants to call himself’ can’t beat no George Foreman,” Foreman after beating five guys in one afternoon in 1975. Heavyweight immortal Jack Dempsey once took part in an exhibition where he fought five men in one night, but the only other former heavyweight king to have faced that many men in one afternoon – over one hour – is living legend George Foreman. As fans know, “Big George,” in an attempt at battling the demons he was tortured by after losing his unbeaten record and world title to the one and only Muhammad Ali, took on five fringe contenders/journeymen types in Toronto Canada in April of 1975. What followed was a quite bizarre, yet at the same time weirdly entertaining – in a car-crash, can’t-take-your-eyes-off kind of way – spectacle. Wearing a frown throughout, this, the “bad guy” version of the heavyweight king who would transform himself into a folk hero a dozen or so years later, actually engaged in seven fights/brawls/scuffles or whatever else you might wish to call them. After despatching Ali spar-mate Alonzo Johnson (Ali at ringside with Howard Cosell, taunting Foreman to the point of real madness throughout the exhibition; a “charade” according to Cosell) with relative ease, Foreman fought a determined Jerry Judge. Twice. After battering the smaller, lighter man (a theme that ran throughout this night, with George out-weighing all five of his foes) to the canvas in the second-round as he had done Johnson, Foreman and Judge began rolling around on the canvas, slinging blows at one another! It was a crazy sight. Foreman’s next fight, against one-time Joe Frazier title challenger Terry Daniels, also saw some after-the-fight violence; this time with the two teams of corner-men joining in – Foreman even shoving his OWN corner-man clean across the ring at one point. Charlie Polite, foe number-four, had the sheer nerve to kiss Foreman during the pre-fight stare-down – an act that was unthinkable prior to Zaire. Polite became the first of the five to go the distance, losing a decision to the brooding former champ. Boone Kirkman was next, and last. Kirkman, who had met a younger version of Foreman in 1970, being stopped quickly, held on to also go the distance with the 40-1(37) former king. And, apart from a bewildering interview where Foreman claimed that, to be considered a great, no fighter “can lay on the ropes and not fight” (a clear dig at Ali, who had by now left the arena to go and attend to yet more commitments) that was that. 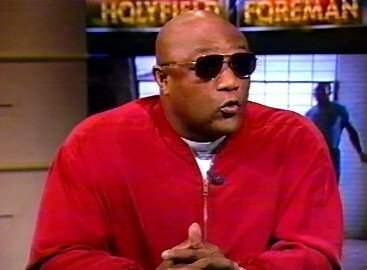 Foreman won all five fights but he didn’t score the predicted KO in each bout. The press Foreman received was almost universally bad, condemning and insulting, but did George really embarrass himself as much as Cosell and co. said he did? Not as much as the beloved Ali degraded himself and his enormous talents with his own weird night – against wrestler Inoki a year or so later. Foreman, in taking on five live bodies, put himself at a degree of risk (even Ali stated how tiring it can be to face one fresh man after another over and over), but he fought, for almost a full hour, and won. Imagine a heavyweight of nowadays having the guts to do what George did. Actually, it would be quite fun to see, say, a Deontay Wilder or a Tyson Fury (now we’re talking!) embark on such a wild exhibition. Previous boxing news: When the great Julio Cesar Chavez lost his unbeaten record – 89-0-1! You are here: Home / Boxing History / George Foreman and the time he fought five men in one night – imagine a top heavyweight doing that today!